As South African universities grapple with transformation, consideration should also be given to the establishment of centres for critical studies on liberalism and institutes for black consciousness and decoloniality, among other initiatives. If not, the imperative for decolonisation that many universities have recognised as important could become mere rhetoric (and one that seeks to minimise changes) than an actual practice. 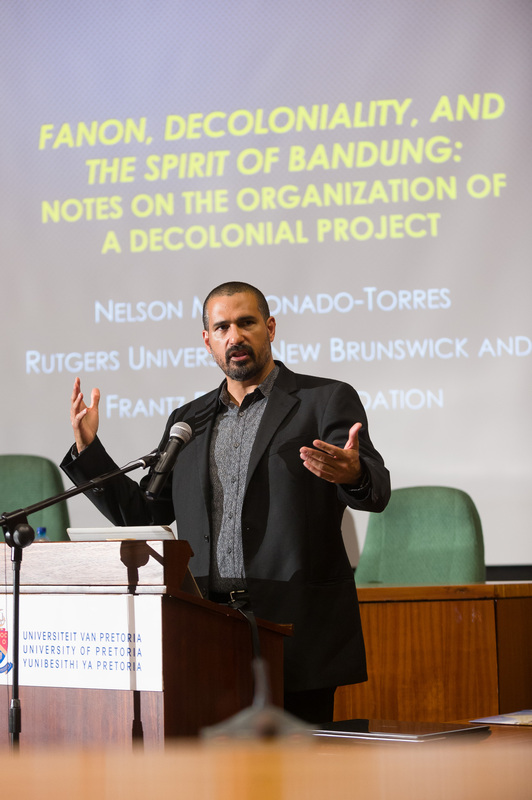 This is the opinion of Professor Nelson Maldonado-Torres of Rutgers University, who spoke on Fanon, Decoloniality and the Spirit of Bandung: Notes on the Organisation of a Decolonial Project at the University of Pretoria (UP). Prof Maldonado-Torres, a professor in the Department of Latino and Caribbean Studies and the Comparative Literature Studies Program at Rutgers University in New Jersey, USA, is a Distinguished Visiting Scholar of the Academy of Science of South Africa, and his lecture was part of UP’s lecture series, Curriculum Transformation Matters: The Decolonial Turn, organised by the office of UP’s Vice-Principal: Academic, Professor Norman Duncan. Prof Maldonado-Torres is an expert on the work of Afro-Caribbean psychiatrist, writer and philosopher Frantz Fanon, who is renowned for his contributions to the critical study of race and racism, colonisation and its deep impact on knowledge, self, society and decolonisation. Following Fanon and others, Prof Maldonado-Torres considers decolonisation, not simply as the end of formal juridico-political colonisation, but as decoloniality: that is, as the effective overcoming of the logic, culture and socio-economic structure that modern Western colonialism, anti-indigeneity, and anti-blackness left or kept in place, even in societies that are considered to be “independent” and “democratic”. Prof Maldonado-Torres explained that centres for critical studies on liberalism and institutes for black consciousness and decoloniality at South African universities would “provide indispensable conceptual tools, theories and refined historical knowledge for the interrogation of widely shared assumptions that distort the meaning and block the possibilities of decoloniality today”. He explained that universities are “temples of white epistemology and anti-blackness” and argues that white epistemology leads to tolerance of and indifference toward anti-blackness. It leads to reconciliation with an order that sustains myths of white and European superiority and that considers blackness and Africanity as signs of inferiority. He argued that “white epistemology objects to or postpones any serious engagement with these areas ad infinitum”. For Prof Maldonado-Torres, when white scholars at universities participate in conversations about decoloniality, they tend to say: “Oh but that belongs to the past. It happened a long time ago, why are they still stuck?” [Or they say] “My ancestors were colonised. You don’t see me complaining or crying.” They then change the conversation to focus on something else. White epistemology is so widely shared among multiple sectors of the population (not only whites) and it is so strongly held that one can almost predict with certainty that these responses will emerge when one brings up the topic of decolonisation. He added that white epistemology impedes talks about reparations and it is dominant in the liberal arts and sciences. Another step in the decolonisation of universities is to create linkages with communities out of the university, “where knowledge can be retrieved and new communities can be formed”. This means that while the university is, or should be, a space for the systematic exploration of knowledge, it is not the only space where knowledge is produced and cultivated. Community organisations have often served as places where ideas, practices and experiences, which have not been seriously considered at universities, have been explored and shared. This is in the Spirit of Bandung, which calls for a non-alignment with ideologies that promote or are indifferent to racial dehumanisation and colonialism (be they liberal, conservative or Marxist) and for new forms of relations and collaborations that can lead to the production of renewed decolonial projects. Prof Maldonado-Torres is involved with the Blackhouse Kollective in Soweto, an organisation which, according to its Facebook page, is “shaping the next generation of black scholars, philosophers, thinkers and activists”. It offers lessons for children and supports the intellectual development of teenagers in Soweto. It is working on weekly classes and a youth camp on “Black Consciousness and Decoloniality” with the collaboration of the Rutgers Advanced Institute for Critical Caribbean Studies (RAICCS). Among other robust activities, universities should create summer schools on decoloniality. “These schools can offer the opportunity for focused and intense study of black consciousness, decoloniality and related areas and should avoid a ‘showcase’ model of simply bringing in lecturers to speak on various topics. They should rather explore decoloniality as a practice. This will be a way to meaningfully connect student and faculty leaders from universities where the summer school takes place, with professors and students from other universities (in South Africa and abroad) and with community organisers. Prof Maldonado-Torres believes that “South Africa could become a major leader in this area on the African continent”. He is intimately familiar with colonisation as his native land of Puerto Rico might be the oldest colony in the world and has never been independent.